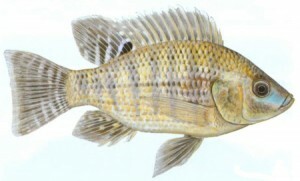 The Nile Kurper (Oreochromis niloticus), more well known around Africa as the Nile Tilapia, is a species of the Cichlid family that was introduced into South African waters, making it an invasive and alien freshwater fish species. It is well known world wide as an important species in aquaculture, but this fish species is highly adaptable and can live in waters from 14 degrees to 45 degrees celsius, which makes it a huge threat in South African conditions. The Nile Kurper is often confused with the endemic Blue Kurper (Mozambique Tilapia), as these two fish look very similar. The Nile Kurper is a threat to the Blue Kurper, as it grows faster and tends to take over areas. It is also destructive in that it consumes the fry of the Blue Kurper and generally outcompetes it for food sources. In other parts of Africa it is known as the Mango Fish (Not to be confused with the Mango Tilapia). The Nile Kurper can live for up to 10 years, reach lengths of 60 centimeters, and attain weights of 4.5 kilograms. It is tolerant of brackish waters with high salinity, and can be found in a variety of different habitats. They do prefer shallow areas that are well vegetated with lots of structure, but can adapt to a variety of other habitats. The Nile Kurper feeds on aquatic plants, algae, mosquito larvae, insects, crabs, shrimps and fish. They can be found all over South Africa, and no specific range has been identified. They were first originally introduced to the Western Cape, but now can be found in all provinces of South Africa. They have invaded the Limpopo river system and all it’s tributaries, as well as many dams, such as Lake Jozini. The Nile Kurper prefers warmer waters in general, and feeds throughout the day, and occasionally into the night. It is a shoaling fish, where there are dominant males that are involved in breeding and spawning. 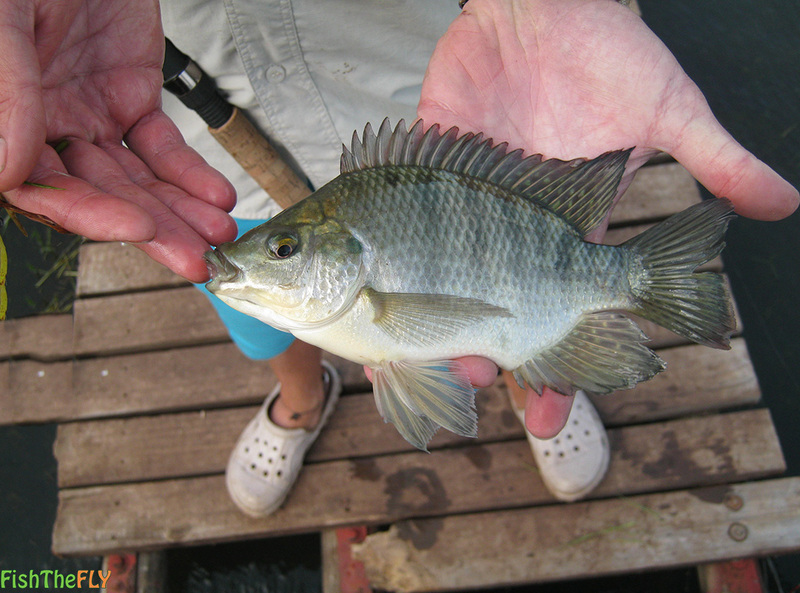 The Nile Tilapia is a mouthbrooder, which means the females carry the eggs, larvae and juveniles in their mouths until the juveniles can fend for themselves. Nile Kurper can be caught on fly, as they are quite an aggressive species. They like movement, and will take a variety of flies, from streamers to wet flies, nymphs and even dry flies. To find Nile Kurper you can fish blind in spots you think they will hold in, or you can look for surface activity. You can often see the shoals of Nile Tilapia making wakes on the surface close to reeds. To target Nile Kurper on fly a 5, 6 or 7 weight fly fishing setup is perfect. You can use floating line, intermediate or sinking line, depending on what depth the fish are at, they are generally in the shallows, so floating and intermediate line is perfect. You should not use a tippet less than 10lbs, because these fish will head for structure and try cut you off, so the heavier you go the better. Slow and figure of 8 retrieves are good and a faster retrieve on streamer patterns will also get the bite and the reaction out of the Nile Kurper.